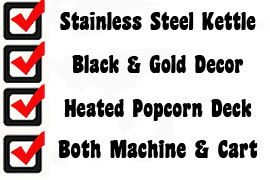 Gold Medal's Fun Pop 8 family of popcorn machines features an 8-oz stainless steel popcorn kettle. 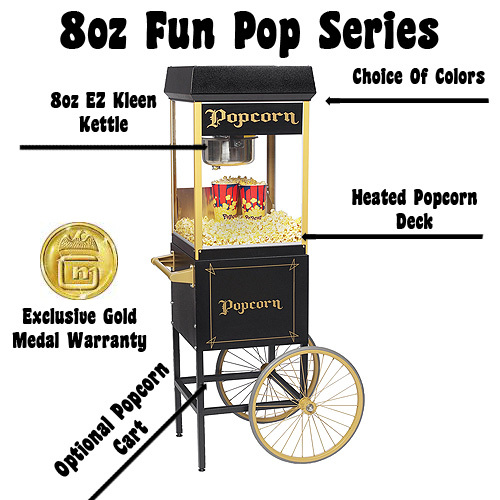 Choose from the traditional Red Fun Pop 8 or go all out and pick up the Black/Gold Fun Pop 8 with machine cart. 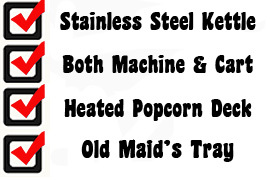 Each of the fun pop family of popcorn machines feature tempered glass sides, plexi-glass pair of doors, lower heating element, and old maid's tray for catching unpopped popcorn. The Fun Pop 8-oz. 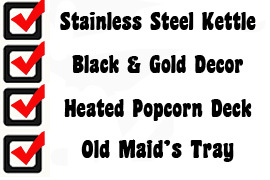 Red Popper #2408 and Black and Gold #2408BG features a textured paint finish with gold corner posts and a heated corn deck and kernel tray. Try this 8-oz. 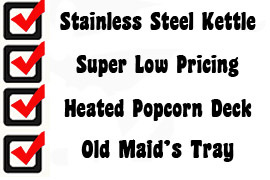 popcorn machine at small venues such as home, banks, schools and more! Cart Dimensions 22"W x 29"D x 34"
Dimensions 19"W x 19" D x 29"